Great pictures. Hope you're not wobbling around too much when you try to walk around on land. All good news. Enjoy your family and your visit, although you will all be real busy over the next few days! Yay, you made it safely! So glad to hear and see that! SHOWER! Enjoy - I hear Capetown is beautiful. What a great photo of u and your Dad and brother!. You look great!. Few…….we were really getting worried because we had not seen a blog for a few days and we knew you were near land….in some pretty bad weather. That can always be trouble as you would know. It’s great to see the photos of you ashore and safe. Enjoy the stopover, get plenty of rest and we hope the various repairs go well. We will keep an eye on your web page and will be looking forward to updates. Kind regards, James and family, Berowra Heights, Sydney, NSW, Australia. Well you made it! And there you are with Dad and Zac. Look at that beautiful smile on your face; your attitude is already up-beat. Now relax and enjoy Cape Town, you deserve it. Well done Ms Abby!!! I have been following and praying every day. You can be so very, very proud. I just can't imagine the strength and courage and Faith it takes to do something like this. You are a role model for your generation for sure. 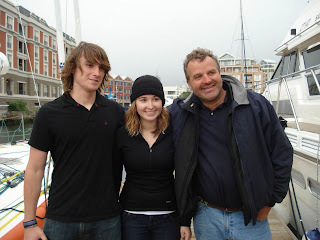 Wow, Abby, I'm glad you made it to Cape town safe and sound and are with your dad and brother. I imagine you must be extremely happy to see them in person again. Well, I'm sure everything will go well and i can't wait to hear any updates. Congrats on how far you've come!!! Way to go! So glad you made it and it's great to see you with your brother and dad. Many blessings! Looks good. You must have been relieved. Abby I am glad you arrived safely! Get some rest I am sure your crew and the sailing community will take great care of your boat! You have done something few people will ever do and I admire you! Looking forward to reading about your repairs the second part of your voyage! One can look at the chart and see there was a stutter attempting a North route around the Falklands which didn't happen because the wind was pushing you towards land and then another stutter at days 82-84 and in hindsight one could wonder why you didn't tack East on day 82 but hey, I'd pay many thousands of dollars if I could go back and redo some of my life's decision :-) Also, as you mentioned, you decreased sail area on this leg to lighten up the strain on your auto pilots. So your potential for a fast sail is there and I hope we'll see it on the third leg. I'm sure you are hoping for the same thing. sorry about the 'land rocking'. will miss your Post for the next fortnight, but happy to learn you will be back. Great Photos and appreciated your Blog. See. You did it and we all knew you would. I'm gald you're in safe and sound. Enjoy your stay, hope the ground is more stable, but don't lose those sea-legs. YOu'll be using them soon enough again. I listened to the KNX radio interview and it was nice to hear Dad say that it was "absolutely incredible she made it into port...emotional...fantastic...Abigail has proven herself". You certainly have. That's a great photo of you with Dad and Zac. Your smile says it all. Abby I loved your comment about the ground moving. I recall finishing a long race on Lake Ontario when I was a little older than you and walking off the boat onto the dock and then right off the other side of the dock into the water. The bystanders at the Prince Edward Yacht Club loved it. I had long hair at the time and I always remember the captain yelling "some dame just fell overboard!" The good old days....this will be YOUR "good old days" someday too....enjoy them. I think you got a special mother's day gift today Marianne with everyone's safe arrival in Cape Town. Love the pix . . . you all look so happy! Rest up and have fun. Well done, Abby. Get Wild Eyes fixed, have a bit of a break and then we'll catch up with you as you continue your RTW circumnavigation. I understand Jessica Watson is due to arrive in Sydney, Saturday morning. You guys are truly awesome. Cheers, from North Canterbury, NZ. GOOD ON YA, ABBY - SO HAPPY TO KNOW YOU HAVE ARRIVED SAFELY - SUPERB SAILING MY GIRL - WON'T BE LONG BEFORE YOU ARE BACK AT SEA AND HAVING TO FIND YOUR 'SEA LEGS' AGAIN - HAVE A SUPER TIME IN C.T. AND I PRAY ALL THE REPAIRS GO SMOOTHLY - BLESS YOU - JUDY G - SURFER'S PDSE - AUS. Congrats, Abby! Happy to hear that you made it in safely to CT. This decision was made with maturity & wisdom beyond your years...I'm sure you felt plenty of relief when you saw all that smoke! Phew! Port! I've always wanted to see CT! Enjoy! I've heard it's wonderful! You won't regret this part of your trip. Seeing parts of the world that you're passing thruough (even if it ends up just being CT) will only make your adventure richer. I know you are anxious to "get back out there", but If you can make the time, I recommend you take a quick safari. I've been on safari in Tanzania & it is something I will never forget...try, if you can swing it! Enjoy the sleep, hot showers, cold drinks & fresh food! So happy that Wild Eyes is getting fixed! And like everybody else I can't wait to read your next blog! Abby, great photo's! I can tell by the expression on your dad's face that words can't describe how proud he is feeling. We are all proud of you. And as you continue your voyage we will all be right there with you, sharing your thoughts and experiences through your blog entries. All these girls, sailing around the world! I wish I had half of their courage. Enjoyed the pictures. It's great you're ashore and getting what you need. I know it must be great to see family again. Get a nice souvenir of Cape Town (as if the auto pliot weren't enough) (kidding) Have fun and God bless!! I keep my family up to date on you!! Wow, do you ever look all grown up, or what? In the 3rd picture, you seem to be leaning a bit (hee, hee). After you get the hydraulic fluid off don't forget to do some girl stuff like a haircut and a manicure. Way to go.... Congrats..!!! I always wanted to sail around the world, or even half way, but don't think I could muster up the courage to do so. I hope you get all the little bugs worked out and continue on your journey. Again... congratulations on a job well done. As always you look so adorable with that winning smile. It is amazing how these pictures bring so much more reality to this adventure. Hope that the repairs would be fixed smoothly. Dear Abby, the planning couldn't have been more perfect for you. And, your dad and bro look so proud and delighted, too, while it seems they are holding on to you respectfully (to help you walk/stand?). You have earned a great amount of regard from me and from many significant others, not doubt mostly from your mom, dad, and family. Young girls around the world will also be positively influenced as can everyone else. I am impressed as you are making decisions that sound so obviously right for you. As much as you may wish to get back to sailing in the spacious ocean beyond all the boat traffic...I hope you take time to see the sights. Thank you for the pictures. I've heard that you looked behind to see black smoke - not during the struggling time coming in and the many sleepless nights - but only after you were already close to port...you've shared how the sun came out just in time though you had been trying to stay ahead of the gale....I remember how Drake's Passage became relatively calm for you, too!! I imagine you are a humble, thankful, loved, and blessed young lady. You are on your path; it seems straight and true but not without its challenges, which you are managing. I will be looking forward to reading more about your experiences...God is with you. Congratulations on making it into Cape Town. The photo of you and Dad with Zac says it all what a fantastic smile. It does look like you are getting a bit of support to stand up.Lol. Enjoy your brief sojourn on dry land. Happy Mothers Day every one. Great job, BTW, you look great! I love the smile. Now, have fun and relax and ENJOY while the team gets Wild Eyes ready for the leg to home. You are doing a great job and the rest of us admire and respect you while being very envious of your skills and your maturity. Thanks to all that supported and support the project, especially Cape Grace hotel and Correne Coetzer. You are looking good and happy. Enjoy the rest and time with family. Abby these are beautiful pictures.Your dad and brother must really be proud of you. What a wonderful and courageous family. 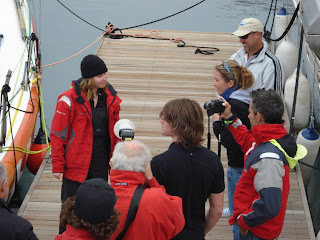 Abby you look fantastic after 105 days at sea. God bless you on the 2nd leg of your voyage. Great photo's Abbey. Enjoy your stay with your family. Great job, well done Abby. Nice to see you together with part of your family. Have a good time, sleep, eat, rest and try to relax and do some sightseeing too. Look forward to read your blog later. Great pictures! Glad to see you made it safely! Catch up on your sleep and can't wait to see you back out there! Family support makes your face shine. As a follower of all the girls' power in sailing, I could only offer you virtual support by writing to share your joy of accomplishing half the journey.Savour every second of your stay in Cape Town. Excellent pics! We are so proud of you. Glad to see you are SMILING with your awesome dad and your awesome brother, Zac. You are loved. Glad you made it to port safely! Enjoy some rest and good food before heading out! Yay! You look amazing! So glad you made it safely. Hope youre getting some much needed sleep! What kind of books do you like to read? Maybe you could let us know and we could all give you some suggestions to pick up for the rest of your journey. I was so happy to see you standing there with your dad and brother Zac. I can only imagine how you felt to see them. for me, I was totally relieved you were on dry land and just as anxious for you to get back out there! Take a little time for you and rest and know this is part of the bigger plan sweet girl. You should be so proud of your accomplishments! Be blessed! Congratulations, Abby, on your safe arrival in C.T. 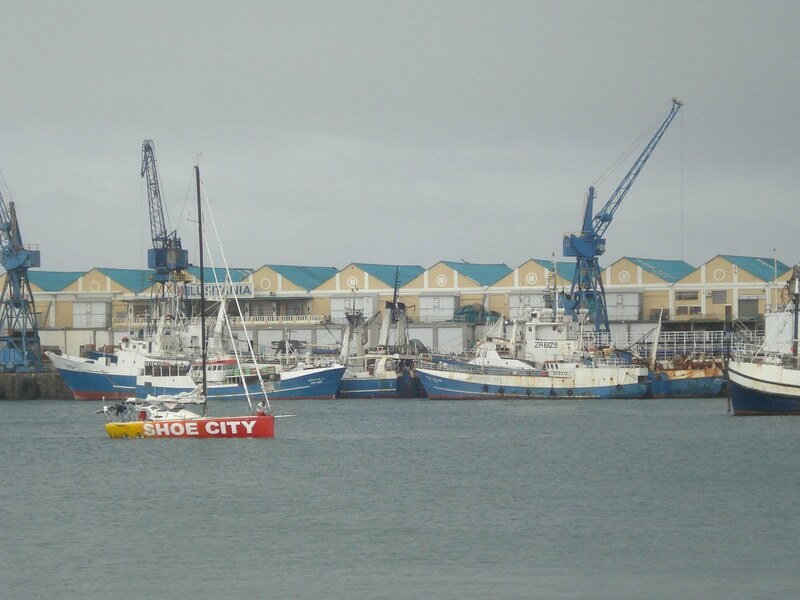 Use GoogleEarth, or the the tracking map over on Jesse's website, and zoom in really tight on the Cape Town marina. By comparing the photos from yesterday's arrival with the satellite view, you can pick out EXACTLY which slip Wild Eyes is resting in. By my reckoning, she is in the middle finger-dock next to the Cape Grace Hotel. This is the building at the left on the photo of Abby, Zac, & Laurence standing on the doc. It was kind of fun to figure this out. You and Wild Eyes have done fabulously, and navigating into Port, "EXCELLENT"
It's pleasure to see your dream coming true. You are becoming a History to the posterity in the annals of adventure.In India we could not think of such thing. I pray to 'Samudra Devta' i.e. God of The Seven Seas to make safe path for you to achieve your desired destination. God speed. Pictures!!! Yey Abby! Glad to see you safe and sound! Wish I was there... :( haha, have a fun time in Cape Town! Jen Edney to the rescue! Captain Abby and Team Abby... Glad to see you made a reunion... I bet there were some tales to tell over dinner. Sorry to hear about the problems.. but those kinds of gremlins sneek up and bite you at the worst possible times.. especially on such a Thoroughbred Boat as Wild Eyes. Sail Safe... Post Often and HAVE FUN..
Good job. We are a classroom of 3rd graders from Charlottesville, VA. We are amazed that you are undertaking such a voyage. We have been following your blog closely. We want you to know that we are inspired by your bravery. We hope the rest of your journey is safe and sound. We’ll be reading all about it from your blog! PS If there is any way you can give us a shout-out in one of your blogs, we would be overjoyed. Thank you! What a memorable picture of three of you!! You look just fabulous after being so many months on the water; Zac and Laurence appear to need more time to recover from the jet lag and the hard work behind the scene. Let the men do all the repair work and retrofitting, you just rest and enjoy yourself. They say Cape Town is a beautiful city to visit. Abby, for someone who's been in the middle of an ocean so long, you look fabulous. I can't imagine being out there alone like that- you are so incredibly courageous! Please get all the rest you need and deserve. Hopefully, your repairs go well, and just because you had to stop certainly doesn't diminish what an accomplishment this is. Your pictures look like this is just a walk in the park for you. Incredible! Keep up the good work. Can't wait to see you pull into San Diego. What a story that will be !!!! G r e a t N e w s ! ! G r e a t P h o t o s!! Beautiful photos Abby, you all look so happy. Well done. I am glad to see that you made it into port safe and sound, wasn’t so bad now, was it? I hope the repair work goes smoothly, I’m anxious to hear about the engine, can it be repaired? Enjoy your ‘downtime’ and try to stay out of the oil and grease. Keep up the good work Abby. Hi Abby how is working coming along, on wildeye's. are you enjoying your stay tthere, i'm sorry i don't wright much. there is a lot of wind and rain here in Canada rate, i hope it warms up soon here. i didn't do to much today other than setting up my my new home theater, i have a yamaha receiver 6.1 surround sound everything just vibrates on the walls. by the way that is a good picture of you your brother and your dad, you must miss your mom a lot i bet i'm going to get my mom something for mothers day i wish she would talk to me more often. i miss my dad a lot i wish he was here, i wish he was here i would give anything just to see him. when he died apart of me did to, i was closer to my father then my mother but i still care about her and i still have respect for her. you are a brave girl keep up the good work ok, if i was there i would help you with your work just so you can get some rest. by the way i just wanted to wish your mom a very happy mothers day. well abby i'm going to go now but all we are is dust in the wind. i will alway's be thinking of you. Why is Abby in the middle of Zac and Laurence? So She won't fall down. I knew the Earth had a wobble to it. What I didn't know is you could feel it. hi Abby i think it is really cool you are sailing around the world because my sister is also 16 and my whole family and I own a sailboat on lake superior.You should also go to lake superior.About 2 years ago i was 11 and i went to the British Vergian Islands and i thought it was the best trip ever.My dad also thinks you are very brave and he wishes you luck on your journey.I found out about you by my magazine GL and I read an article on you in there and I found it very interesting and they said some really cool stuff about you.I just want to wish you luck again. So nice to hear from you again. The pictures were really nice! Good to see that you are having a nice time out there Abby. I wish you luck with the repairs on your boat and hope all gets done soon. Congrats Jesse and Still Working!